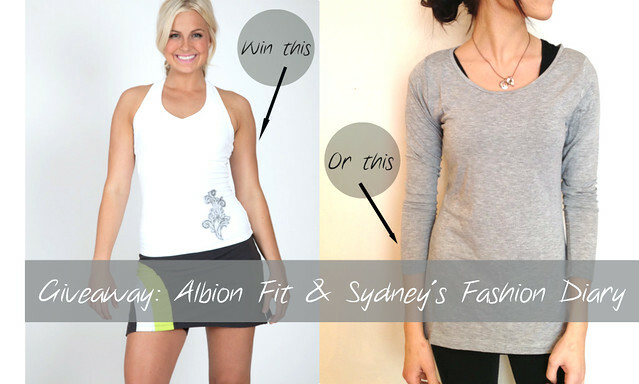 As mentioned here, Albion Fit is giving away either their Classic Racerback or Go Long Crew to one lucky winner of Sydney's Fashion Diary (in the color and size of your choice). I am wearing the Go Long Crew in XS here. If you're interested, please fill out the raffle form below. In addition, Albion Fit also offers you guys an exclusive discount of $15 off any purchase of $50 or more. Use code "SYDNEYFASHION15" at check out. The promotion expires 03.12.2013. The giveaway is open to U.S. only and closes on Wednesday 03.13.2013. Thanks to Albion Fit for sponsoring the giveaway and good luck to those entering!